Today I want to share the inside of my office closet! I’m using this bedroom sized closet to store my small home decor pieces and also my craft supplies! 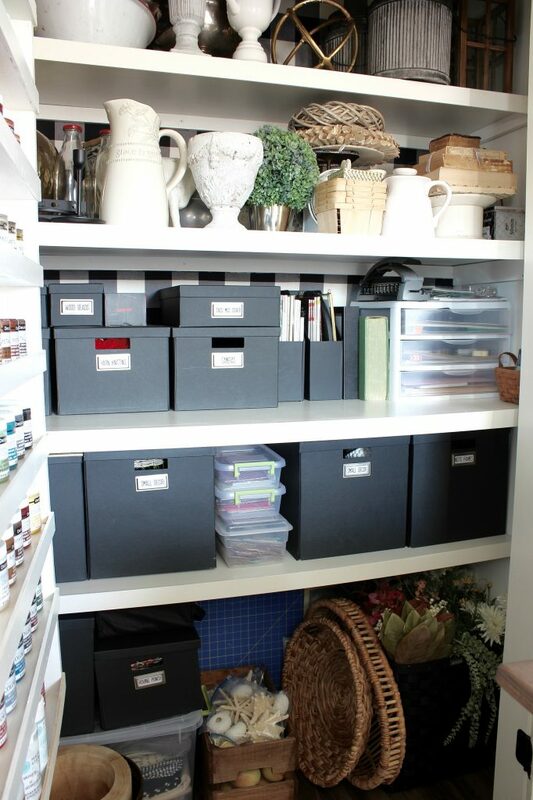 I’ve had home decor scattered around my house in cabinets and closets and even in the garage for years! Now, I have most of it stored in this one space in my office! And, the same goes for my craft supplies! Most were in our lower level family room, where I’ve worked for the past 10 years! Can I say right here how happy I am to have my own little space with a window to see the sunshine!!!! The idea of getting everything into one closet space seemed unlikely to both my husband and me! But, we were both amazed at how much I did get moved into this closet! The key was organization! Here’s a look at what the inside of my closet looks like today! *This post contains some affiliate links for your convenience. Please see my full disclosure at the bottom of this page. The first thing that helped tremendously were these storage racks that Mark built for inside the closet doors. They store a lot of small things and keep them out where I can see them! These storage racks are an easy build and I’ll be sharing more about them soon! The top two closet shelves hold my larger decor items: lanterns, planters, candlesticks, etc. The next shelf holds more decor: vintage scales, pitchers, planters, more candlesticks, etc. On the two remaining shelves I used the black Tjena boxes from Ikea to store small items like candles, small faux plants, yarn, etc. I used these stick on metal bookplates to label the front of each box with the contents. If I change out what’s in the box, I can easily change the slide in label. I also have some clear plastic containers that I had on hand – the slide out drawer container holds craft paper, the three smaller containers in the middle of the bottom shelf hold small party bags, greeting cards, and decorative tags and labels. On the floor is a large plastic container that holds my fabric supply. At one time I had an entire dresser filled with fabric. I went through that and only kept what I think I will use. The rest will be sold or donated. The wooden crate holds individual gallon zip-lock bags with faux fruit and shells. 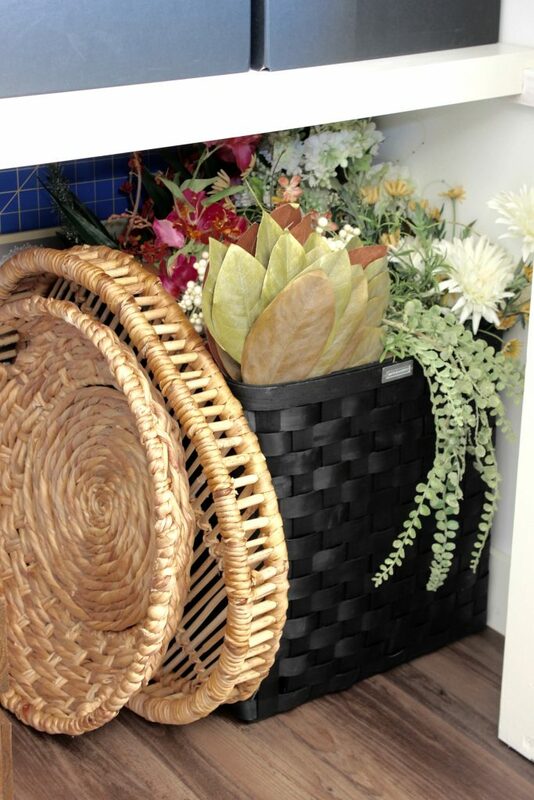 There’s room for some serving baskets and large planters too. I got this large Smith and Hawken basket from Target to hold my faux flowers. I had more than this, and again, I went through everything and kept only the ones that I think I will use. I initially had everything laying flat in a large storage container, but I like them stored this way so I can see what I have without taking a lid off. 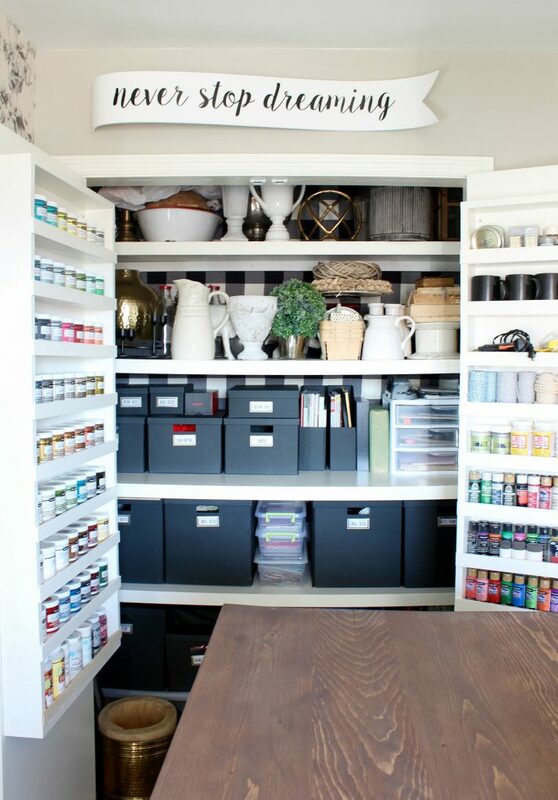 If you saw my One Room Challenge home office reveal, you know that I also have some storage under my work counter. A lot of what was under there were the craft supplies that you see in those door racks. Now, the main thing under my work counter is my sewing machine and sewing related items like patterns, a bin of trims, thread, etc. It’s nice to have everything I need for sewing in one place too! Soon I’ll be sharing some other updates I’ve made to my office, including a special place for Sadie to sleep while I’m working and more tips for small space organization! Organization has been the key for me to make this small office work! Thanks for stopping by today and if you like what you see, please share it with your friends on Facebook, Instagram, or Pinterest! 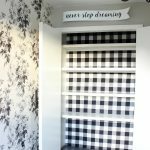 See how I lined the inside closet walls with buffalo check fabric HERE. 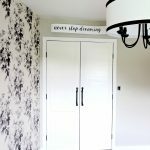 See how we made the custom doors for this closet HERE. I really needed this post for inspiration. Oh how I need organize my crafts too! I also tend to keep my scrapbook supplies all over 😬. Your closet gives me some inspiration. And…my craft space was in the lower level and I moved everything to a small second bedroom. The guest bedroom is now downstairs and I’m so happy with the change. So wonderful. It’s so nice to have it all handy. 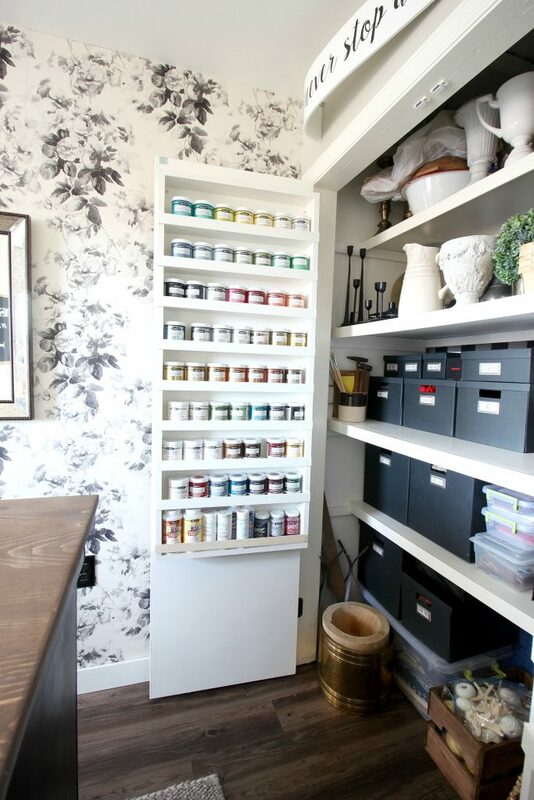 This makes me want to review my craft things I’m not using and get reorganized!! It looks wonderful. Thank you for sharing this major project. Love this! I’m wondering where you found the “Never Stop Dreaming” sign above your closet door? Hi, Kim! I found it at HomeGoods! Wow! Now THAT is organized!!! Wow!!! That closet looks awesome! Are you aware of Art of Recycle in Ephrata? They take all kinds of craft supply donations. They also sell craft supplies – and all kinds of cool stuff – very inexpensively! This looks SO amazing, Doreen! Such a beautiful, functional closet! Great job! This is such a great use of space. A lot of work went into this. 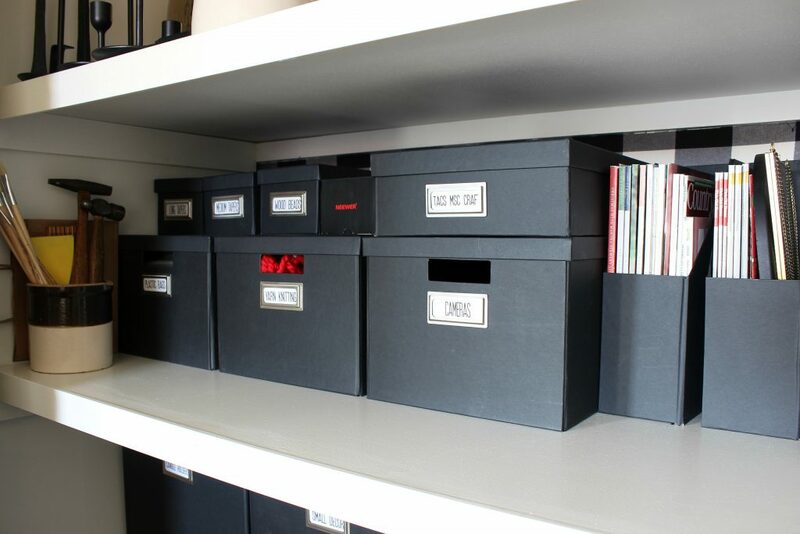 How fun to be so organized. I don’t do many crafts, just home decor. I need to get rid of more. Love the organization! This is amazing!! So organized!! 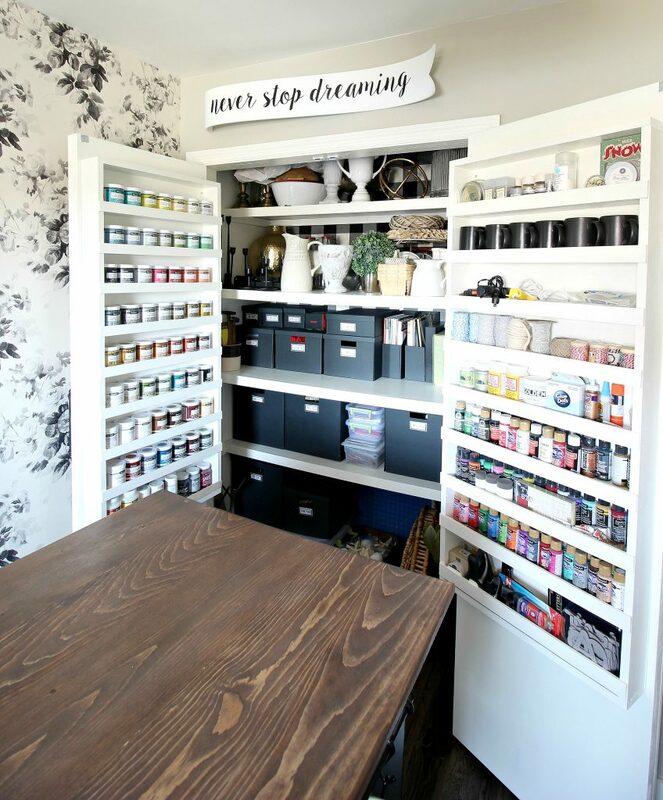 I so need something like this for my sewing room! If only you could see! !😱😂Thanks for sharing! Gorgeous, gorgeous gorgeous! Love the buffalo check with the floral wallpaper. I squealed when I saw your pictures. I watched an episode of a remodeling show on HGTV in January and they did a room with similar wallpaper. I took a bunch of screen shots of the TV on my phone. You’ve taken me right to the source. Love it all! Your room is so beautiful!